Founded in 1890, Designmuseum Danmark is located at the heart of historical Copenhagen. The museum's main goal from the beginning was to communicate the idea of quality within design. By exhibiting exemplary objects and collections, the museum seeks to raise the level of Danish industrial products and act as a source of inspiration for people working in industry. It also aims at making contemporary consumers more critical and quality-oriented. Designmuseum Danmark is a self-governing institution and a special museum recognised by the Danish government. The museum receives public support under the Museum Law from the Danish Ministry of Culture and the Danish Agency for Culture and Palaces. Support corresponds to app. 30 % of the annual turnover. The museum is led by a Board chosen by the museum representative office. Designmuseum Danmark aims to create an internationally leading design museum that communicates the story about Denmark as a design society and the value-creating potential of design. With its archives, library, and collections, the museum constitutes Denmark's collective design memory and knowledge centre as a source of inspiration for future designs. Our audience includes those who work with design professionally as well as everyone whose daily life - directly and indirectly - is shaped by design and quality craftsmanship. In 2017, Designmuseum Danmark received the DASA Award. The DASA Award, launched in 2010, is focusing on excellence in learning opportunities provided by museums. The new strategy has transformed the Designmuseum from a traditional museum to one which is relevant to the 21st century, attracting visitors of all ages and from all walks of life. In 2017, the museum welcomed 300.000 visitors, a number that has increased fivefold since 2011. 50% of the visitors are under 30. This increase has mainly been due to an increase in younger people coming to the museum and additionally to a rise in international visitors. With this open format, the museum aims to inspire visitors, industry, the design field, educational programmes and everyone living in a world increasingly shaped by design. The subject design and crafts is now part of the national curriculum, and within its educational programme the museum runs sessions for school children of all ages. It also takes part in educational networks and general collaborations at national and international level and in all its work emphasises social awareness. 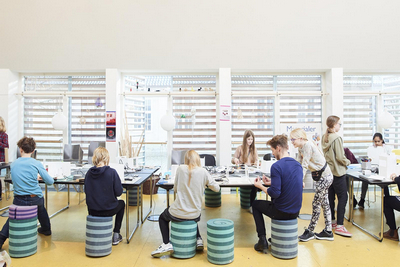 At Designmuseum Danmark we strive to create an environment of learning where everyone can participate. All our teaching is based on dialogue and active participation, as well as hands-on activities. The focus on children as a primary target group over the past 6 years has increased the number of school and educational visits significantly. Every day children from kindergartens and public schools participate in learning programmes at the museum. We have also developed an extensive outreach program of design classes and workshops aimed at audiences that traditionally do not visit the museum. 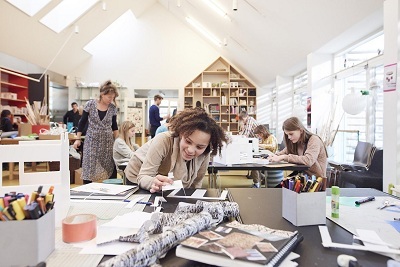 We have a design school where children of all ages take design classes in their spare time, as well as free family workshops every Sunday and during holidays. Recently we started a program focusing on children and young adults seeking asylum in Denmark. The allover aim for this whole program is to focus on outreach and the fact that design can build bridges. The asylum programme is built on the basis of the museumrs"s quality educational platform for school children and youth in general, drawing on our learning initiatives and pedagogical competencies. The background for the project is an interest in the idea that the museum can contribute to vulnerable groups having positive experiences working with design and creative processes and through that gain a feeling of having skills and resourcefulness in whatever situation they are in. We know from research that there is a need for creative teaching and thinking and that teachers working with these groups in many cases do not have the skills or the time to create an environment for learning and activities in this field. This project is a design programme aimed at asylum-seeking children from primary and lower secondary school. All participating children and teachers come from the same Red Cross school and the project was born out of a collaboration with leaders and teachers from this school two years ago. The programme takes place over a number of classes where children are working with different topics in three-hour workshops, and also includes a tour of the museum exhibitions. We have developed a simple set of pictograms to be able to communicate and the structure for the day is the same in every time the class is at the museum, ensuring predictability. In every class we work with sketches at the museum and with building models. So, there is a lot of hands-on learning and doing which occupies the mind and appeals to children in a meaningful way. We wanted to emphasize how the special nature of the design process and design pedagogy are tools to engage with the vulnerable children and young people in a positive way. The fundamental concept is that the children are able. They are able to create, to learn, to have an opinion and to immerse themselves in a creative process. This also trains basic attention skills, like learning how to stay focused, which can be especially difficult for this group. Therefore, we always incorporate some physical activities during the class. In this process, they also learn new Danish words in an implicit manner. The children build, for example, their own model of a chair, a toy, or a model of a public space. In that process their opinion and choices are valued and count just as much as that of the "experts". They learn to make their own choices based on creating concrete design objects, which everyone can relate to regardless of their background or circumstances. This is a position they are rarely in, and which boosts their self-esteem and confidence. These skills are transferable to other aspects of their life and help children and young people manifest themselves as individuals with a right to speak up. As an institution we have learned a lot from this project and we are convinced that our efforts and experiences can be used on a much wider scale. Therefore, we are now working on getting funding for a larger project, which targets vulnerable young people in Denmark. For more than 125 years, we have brought people together around good design and innovative forms. Our collections, archives and research show Danish design in an international perspective. With our Strategy Plan 2020, we hope to reach out to an even wider public, because we believe that everyone can be inspired by the past to take part in designing the future.